Bath and Body products which provide a beautiful experience. Peppermint Candy Lip Balm has an invigoratingly fresh minty scent and flavor with just a hint of sweet. Ingredients: Shea Butter, Coconut Oil, Beeswax, and the 8 Essential Oils of: Peppermint, Spearmint, Copaiba, Lime, Cedarwood, Vanilla, Ocatea, and Lavender. Mint Chocolate Chip Lip Balm is a delight to the senses! Moisturize your lips while enjoying the flavor of minty chocolate! Ingredients: Shea Butter, Coconut Oil, Beeswax, 85% Dark Chocolate (chocolate [cocoa liquor, cocoa butter, fat-reduced cocoa], sugar, soy lecithin emulsifier, vanilla extract), Peppermint Essential Oil, Spearmint Essential Oil. Who doesn't love the flavor of cinnamon and sugar? Here's a lip balm with a burst of delicious cinnamon. Ingredients: Shea Butter, Coconut Oil, Beeswax, Stevia, Cinnamon Bark Essential Oil. Get that soothing, clean and clear-headed feeling with a chapstick infused with Eucalyptus and Menthol! Ingredients: Shea Butter, Coconut Oil, Beeswax, Eucalyptus Globulus Essential Oil, Eucalyptus Radiata Essential Oil, and Peppermint Essential Oil. This lip balm is made with the same oils used in the famous Thieves Essential Oil Blend. Ingredients: Shea Butter, Coconut Oil, Beeswax, Clove Essential Oil, Lemon Essential Oil, Cinnamon Essential Oil, Eucalyptus Radiata Essential Oil, and Rosemary Essential Oil. Get your HAPPY on! These bath salts uplift the spirits. Ingredients: Epsom Salt, Baking Soda, and the Essential Oils of: Bergamot, Copaiba, Ylang Ylang, Lime, Geranium, Lemon, Coriander, Tangerine, Cedarwood, Vanilla, Ocotea, Lavender, Jasmine, Roman Chamomile, Palmarosa, and Rose. Looking for a YAWN? 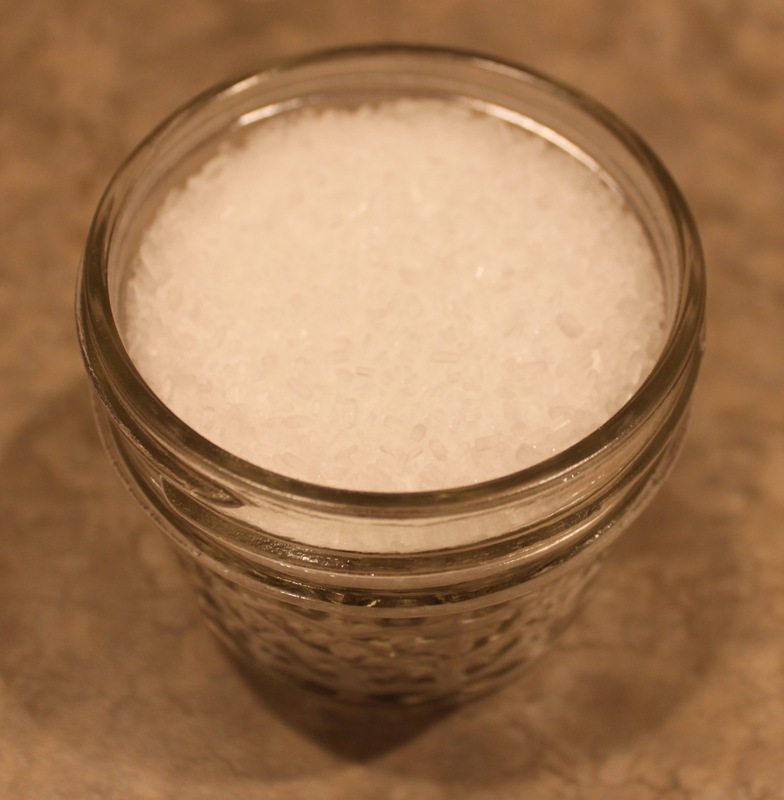 Soak in these bath salts to prepare for a wonderful nights rest. Ingredients: Epsom Salt, Baking Soda, and the Essential Oils of: Lavender, Geranium, Rosewood, Coriander, Palmarosa, Ylang Ylang, Roman Chamomile, Lemon, Jasmine, and Rose. Need a time-out from life? Jump in the bath with these salts and watch your stress relax away. Ingredients: Epsom Salt, Baking Soda, and the Essential Oils of: Copaiba, Lime, Cedarwood, Vanilla, Geranium, Rosewood, Coriander, Palmarosa, Ocotea, Lavender, Ylang Ylang, Roman Chamomile, Lemon, Jasmine, and Rose. Have you had a good hard workout? Soothe your muscles with this blend of delightful bath salts. Ingredients: Epsom Salt, Baking Soda, and the Essential Oils of: Peppermint, Wintergreen, Sage, Plectranthus Oregano, Balsam Copaiba, Niaouli, Lavender, Blue Cypress, Elemi, Vetiver, Caraway, Dorado Azul, and Matricaria. Ingredients: Epsom Salt, Baking Soda, and the Essential Oils of: Cypress, Geranium, Clary Sage, Fennel, Lavender, Marjoram, Yarrow, and Jasmine. Feel the luxury of this soothing bath fizzie, which will have you feeling like you're melting into the bath tub. Ingredients: Baking Soda, Arrowroot, Citric Acid, Shea Butter, Jojoba Oil, and the Essential Oils of: Lavender, Geranium, Rosewood, Lemon, Mandarin, Jasmine, Roman Chamomile, Bergamot, Ylang Ylang, Palmarosa, and Rose. Experience a refreshing and uplifting experience as this fizzie exudes and explosion of citrus scents! Ingredients: Baking Soda, Arrowroot, Citric Acid, Shea Butter, Jojoba Oil, and the Essential Oils of: Orange, Tangerine, Grapefruit, Lemon, Bergamot, Mandarin, Lime, and Spearmint. Add this fizzie and enjoy a burst of the warm, familiar scent of a pumpkin pie as you relax in the bath. Ingredients: Baking Soda, Arrowroot, Citric Acid, Shea Butter, Jojoba Oil, and the Essential Oils of: Cinnamon Bark, Nutmeg, Ginger, Clove, and Ylang Ylang. 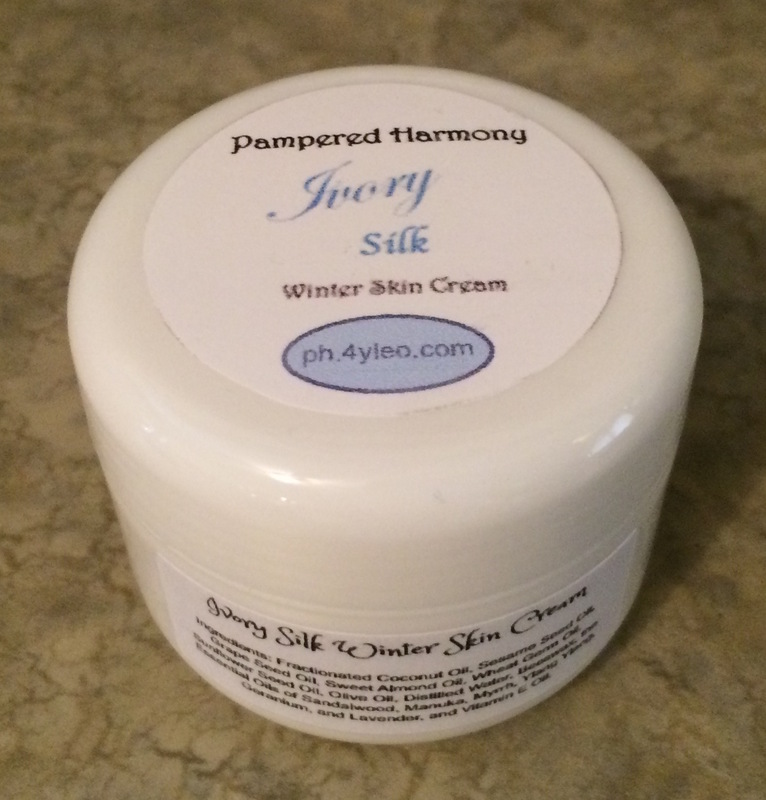 This is THE skin cream for dry, winter skin. Avoid having to deal with the sandpaper that accompanies Jack Frost! Ingredients: Fractionated Coconut Oil, Sesame Seed Oil, Grape Seed Oil, Sweet Almond Oil, Wheat Germ Oil, Sunflower Seed Oil, Olive Oil, Distilled Water, Natural Beeswax, the Essential oils of: Myrrh, Ylang Ylang, Geranium, Lavender, Manuka, and Sandalwood, and Vitamin E Oil. This skin cream is the epitome of luxury. It feels absolutely heavenly and the scent is intoxicating. Ingredients: Fractionated Coconut Oil, Sesame Seed Oil, Grape Seed Oil, Sweet Almond Oil, Wheat Germ Oil, Sunflower Seed Oil, Olive Oil, Distilled Water, Natural Beeswax, Sweet Almond Oil, the Essential oils of: Lavender, Manuka, Bergamot, Myrrh, Geranium, Royal Hawaiian sandalwood, Rosewood, Ylang ylang, Spruce, Hyssop, Melissa, and Rose, and Vitamin E Oil. This skin cream is light and delightful so your skin gets a kiss of nourishing moisture. Ingredients: Fractionated Coconut Oil, Sesame Seed Oil, Grape Seed Oil, Sweet Almond Oil, Wheat Germ Oil, Sunflower Seed Oil, Olive Oil, Distilled Water, Natural Beeswax, the Essential oils of: Lavender, Bergamot, Ylang ylang, Geranium, Lemon, Coriander, Tangerine, Jasmine, Roman chamomile, Palmarosa, and Rose, and Vitamin E Oil. Our 3 oz soaps are moisturizing and cleansing. This is a lovely 50:50 bar of soap. One side is a honey glycerine and the other side is a shea butter glycerine. Absolutely beautiful! Ingredients: Coconut Oil, Palm Oil, Safflower Oil, Kosher Vegetable Glycerine, Honey, Shea Butter, Purified Water, Sodium Hydroxide, Sorbitol, Sorbitan Oleate, Soy Bean Protein, Titanium Dioxide, and the Essential Oils of: Cedarwood, Orange, and Cinnamon Bark. A lovely Eucalyptus Honey Bar that cleanses while moisturizing. Ingredients: Coconut Oil, Palm Oil, Safflower Oil, Kosher Vegetable Glycerine, Honey, Purified Water, Sodium Hydroxide, Sorbitol, Sorbitan Oleate, Soy Bean Protein, and the Essential Oils of: Eucalyptus Globulus, Eucalyptus Radiata, Lemon, Peppermint, Rosemary, and Spearmint. This beautiful shea butter bar creates a wonderful lather. Ingredients: Coconut Oil, Palm Oil, Safflower Oil, Kosher Vegetable Glycerine, Shea butter, Purified Water, Sodium Hydroxide, Sorbitol, Sorbitan Oleate, Soy Bean Protein, Titanium Dioxide, and the Essential Oils of: Lavender, Bergamot, and Ylang Ylang. This spritz freshens the air, so spray it around the house or in any room that needs a little help smelling nice. Ingredients: Distilled Water, Witch Hazel, the Essential Oils of Orange, Peppermint, Citronella, Lemongrass, Lavandin, Rosemary, Tea Tree, and Myrtle, and Epsom Salt. This spray will uplift the spirits. Spritz on linens or around the room for a cheerful mood-booster! Ingredients: Distilled Water, the Essential Oils of Bergamot, Ylang Ylang, Geranium, Lemon, Coriander, Tangerine, Jasmine, Roman Chamomile, Palmarosa, and Rose, and Epsom Salt. Ingredients: Distilled Water, the Essential Oils of Lavender, Bergamot, Ylang Ylang, Geranium, Lemon, Coriander, Tangerine, Jasmine, Roman Chamomile, Palmarosa, and Rose, and Epsom Salt. This throat spray is wonderful for soothing and slightly numbing your throat whenever you feel you need it. Ingredients: Distilled Water, Honey, Vodka, Copaiba, Lemon, Clove, Cinnamon Bark, Peppermint, Eucalyptus Radiata, Rosemary. Have fun going camping without all the outdoor annoyances that surround you! Ingredients: Distilled Water, Witch Hazel, and the Essential Oils of Tea Tree, Citronella, Lemon, Geranium, Lavender, Peppermint, Clove, Lemongrass, Lavandin, Cinnamon Bark, Rosemary, Eucalyptus Radiata, and Myrtle. Spritz this in the toilet to create a vapor barrier before you sit down and save yourself the embarrassment of the aftermath! Ingredients: Distilled Water, the Essential Oils of Lemongrass, Orange, Tangerine, Grapefruit, Lemon, Mandarin, and Spearmint, and Epsom Salt. Please note that some of the links on this page may be affiliate links. continue to provide our users with free content. This page belongs to Lydia, my 9-year old daughter. She has started her own small business making safe personal care products for others. Please consider supporting her endeavor!